Mentioning the Minnesota Twins and the words “pennant contender” have not been connected in the same sentence for several years now. But maybe, just maybe, we’re seeing an uprising down at Target Field, right here in the middle of June, 2014. Don’t be surprised if the Twins make a spirited bid in the middle third of this long baseball season to become a contender in the American League’s Central Division, and you heard it here first. If I’m right, Minnesota could be on the verge of taking a giant step upward in pro sports. I’m convinced the Minnesota Wild will be a strong factor all seasonand be a contender in the NHL next season. I also think the Vikings will thrust themselves up into contention in the NFL, with a new coach and a new “Quarterback of the Future,” this fall. Only the Timberwolves seem in danger of continuing to dribble in the wilderness, particularly if, indeed, Kevin Love demands to go elsewhere despite flipping over to Flip Saunders as coach. The idea of the Twins, though, may seem the most outrageous, because they are currently stuck in last place in the AL Central. But it hit me over the weekend that there is light at the end of the tunnel, and it showed a glimmer just as the Twins sank to last place in the Central by being thrashed by Houston. Houston! Having never subscribed to the bandwagon approach, I suggested during last year’s woeful season that baseball fans should just start enjoying each Twins game for its entertainment value and forget about putting each game into the context of what a bad overall season it was. Good way to stay sane, in my opinion. This year, I was a cynic when the Twins spent a bunch of money on some starting pitchers, mainly because it seemed like a lot of money for three or four guys who might not do the job. Besides, Josh Willingham. Jason Kubel and Jason Bartlett had barely made contact throughout training camp exhibition play, which made me wonder just how far Joe Mauer could take this club. When the season started, the starting pitchers had bonuses for hitting the fattest part of opposing bats, because they did it with such regularity. Strangely, the hitting was good. Mauer only got into one hot streak, and it ended when he went out for a week with back problems. But Brian Dozier, Willingham, and the crop of no-names with names like Arcia, Hicks and Santana hit the ball very well — only to be undone by that shaky starting pitching. Finally, in mid-May, the starters started to look OK, then pretty good, and then very impressive. Even Ricky Nolasco, who is the second-highest-paid player on the roster behind Mauer, seems on the verge of a “quality start” pretty soon. With Dozier diving around making spectacular plays at second base every game, in the field, the club was entertaining. They’d win a few, reaching the .500 mark and second place in the division, then lose half a dozen, in a disturbing pattern of inconsistency. But I saw hope. And two factors came on — with the improvement of the starting pitchers being one, and the certainty, in my mind, that Joe Mauer will get his act together and get on a tear. He has gotten a weird tendency to strike out under control, and he’s hitting the ball sharply. Any day now, he will start on one of those rampages where every opposing pitch becomes either a ball or a line drive. When that happens, I figured, the Twins could stalk their way upward through the Central Division field, which resembles the Detroit Tigers and four teams reluctant to be contenders. Then last week, Twins general manager Terry Ryan shocked Twins fans by augmenting that Team No-Name batting order with the signing of Kendrys Morales. Not exactly a household name, true, but Morales hit 45 home runs for the Seattle Mariners in the last two seasons. He may not get into the lineup right away, but his impact already has been evident. The Twins players seem to have more bounce in their step, as if suddenly realizing that the front office is serious about becoming a contender. Yes, Morales has raised the spirit inside the Twins clubhouse and in the stands, and at home watching on cable or listening to the radio. It is a stretch, to be sure, to compare it to the enormous impact the Vikings made when they signed Brett Favre a few years ago, or when the Wild signed Zach Parise and Ryan Suter in a move that started that franchise moving upward to a point where its potential is just now becoming evident. The mental part of the game is amazing. The Vikings roared into the playoffs behind Favre, and the surge of optimism among Wild players proved Parise and Suter had more impact in optimism. There could be a similar surge within the Twins at the Morales signing, and if so, Terry Ryan made another big move to kick-start the attitude change. If I’m wrong, we can go back to watching Hughes pitch, Dozier dive for grounders, Willingham and Arcia socking balls out of Target Field, and enjoying the entertainment value. But if I’m right, the Twins will go directly to second place, and by then, the mighty Detroit Tigers had better be on a roll or else that Twins image in their rear-view mirror will keep getting larger and larger. GOOFY HUNCHES OR CRAFTY CALCULATIONS? Goofy hunches can hit right in the middle of doing something else. But those goofy hunches sometimes connect in a big way, too. For example, last August, I determined that the Seattle Seahawks would win the Super Bowl. I liked their team, and calculated that they had it all — a contemporary gunslinger at quarterback in Russell Wilson, a strong running game, and an effectiveliy nasty defense. It worked out. Similarly, while the Twin Cities media was deciding that their chore of covering playoff hockey would be short, because Colorado was so explosively fast, I picked the Minnesota Wild to beat the Avalanche. I stuck with that pick even after the Wild lost the first two games out in Denver, because when it all broke down, I thought the Wild’s balance and unsung workers, plus an outstanding and almost charismatic defensive attitude instilled by coach Mike Yeo, would overcome the unheard of musical-chair goaltending situation. Again, it worked out. And it is the reason for my optimism for the Wild next season. A few weeks ago, while watching the Wild tangle with the Chicago Blackhawks, I also watched some telecasts of the Anaheim-Los Angeles series. I sent a text message to my younger son, Jeff, out in Bellingham, Wash., and said: “I think the LA Kings are the best team in the playoffs right now.” I decided right then that the Los Angeles Kings were going to win the Stanley Cup. The dynamic duo of Anze Kopitar and Marian Gaborik, plus some other aggressively skilled forwards, a fast and mobile defense, and they goaltender Jonathan Quick, who is capable of flat stonewalling any opponent in any selected game, made the pick rational to me. The Kings have a young defenseman named Drew Doughty who might be the best defenseman in the NHL. And he’s only 24. But my main reason for picking the Kings is that they have this indomitable spirit that allows them to rise up even after falling behind — in a game or in a series — and simply take over games. And here they are, battling the New York Rangers for the Stanley Cup. When you’re in the sports-writing business, you’d like to think your guesses are educated, but in many cases, my guesses are pretty whimsical, taking a shot on teams that have an almost mystical ability to will themselves to win. They have singlehandedly reversed NHL tradition. When the Kings beat the Blackhawks in Game 7 in Chicago, they fell behind 2-0 before roaring back and getting the lead, and ultimately the victory. When the Kings opened the final against the New York Rangers, the Rangers were 14-0 in games when they led after two periods. Seems logical. But in Game 1 in Los Angeles, the Rangers stormed to an early 2-0 lead. It prompted the tv analysts to proclaim that the Rangers were clearly the fresher of the two teams going into the third period, and both favored the Rangers to win; the Kings kicked it into gear, came back to tie 2-2, and won 3-2 in overtime. In Game 2, the Rangers stormed to another 2-0 head-start, and I pulled out the ol’ cell phone and texted Jeff: “Looks like the Kings have ’em right where they want ’em.” I was being sarcastic, but incredibly, about two minutes later, the Kings scored. Again Milbury and Jones proclaimed the Rangers the stronger team through two periods and virtually certain to even the series. Oops! They must have piped that NBC-Sports telecast into the Kings dressing room, because the Kings not only overcame a 2-0 deficit but also a 4-2 deficit, then outshot the “fresher” Rangers 22-3 in the third period, tied the game, and then won it in double overtime 5-4. A pivotal goal for the Kings came on a blistering shot from the point, just as LA’s Dwight King skated from behind the net trying to get out front on the left of the cage. Ryan McDonagh, former Cretin-Derham Hall and Wisconsin Badger standout, and an emerging superstar defenseman for the Rangers, tried to squeeze off King to prevent him from getting tip-in position, and, as defensemen are wont to do, he hip-checked King right into goaltender Henrik Lundqvist as the shot came flying in. The puck hit King and went in, and even though McDonagh was still standing over the King-on-Lundqvist pile, the Rangers screamed that the goal should be disallowed for a goaltender interference penalty on King. That goal cut the Ranger lead from 4-2 to 4-3 — yes, the Rangers had two two-goal leads in this one — and was the springboard for another shocking Kings comeback. Amazing. That sent the series to New York for Monday’s Game 3 and Wednesday’s Game 4. But by then, leading after two periods, even by two goals, was no longer a weapon the Rangers could lean on. In fact, in those 3-2 and 5-4 overtime classics, the LA Kings never once held the lead in regulation play. The only time they led in the first two games was after scoring the overtime game-winners. Not only do they not seem to mind, but the Kings don’t ever lose their poise if they get behind. That’s a tribute to coach Darryl Sutter, and to the players assembled. In Game 3, there was no need for a Kings comeback. They scored with 0.7 seconds on the clock to end the first period, made it 2-0 in the second, and 3-0 in the third — despite being outshot 32-15. Jonathan Quick stopped everything in his best game of a sensational spring, and the Kings took a 3-0 stranglehold on the series. True, only four NHL teams in history have ever come back from a 3-0 deficit to win a seven-game series, and the only one to do it in the final was Toronto in 1942 against Detroit. There had been only three teams to have done it in any series, until LA became the fourth by spotting San Jose the first three games and then going on the surge that is carrying them to the Stanley Cup. Among things that bore me beyond reason is the NFL draft. I mean, every journalist in the country stirs up football fans to actually sit for hours and watch broadcasts of guys making random picks of random players who might someday help the home team. I had watched a lot of college football last fall, and after a fantastic performance caught my eye at one point, I decided to tune in to watch Louisville play so I could focus in on this guy., Teddy Bridgewater. The mountain of publicity for Johnny Manziel and other QB prospects had obscured Bridgewater pretty much, but Louisville kept winning, and I was impressed. He threw bullet passes, he had quick feet, he ran the offense impressively, seemed to hit the right notes on audibles, but the one thing that stood out to me was that when the defense had a hard pass covered, Bridgewater had the ability and the touch to lob a perfectly feathered pass over the defenders and into the waiting arms of his receivers. Not many quarterbacks in college have the ability to pass both hard and soft, and know when to do which. On the eve of the draft, I said forget all those other quarterbacks, the perfect fit for the Vikings would be Teddy Bridgewater. Because I only pay mild attention to the first round of the draft, and I was disappointed that the Vikings hadn’t taken one of the promising available quarterbacks to seal up their biggest problem, I made the comment that no matter what else the Vikings do, people will be very upset that they didn’t take a quarterback. “But they did take a quarterback,” I was told. Then I learned the Vikings had made a late trade to get into position to take one last player, with the last pick of the first round. They took Teddy Bridgewater. There are critics and others who are quick to say he can’t do it and it was a mistake. And the Vikings are correct to say he will just come in and be No. 3 to start training camp. My response was that then it will only take until the end of the first quarter of the first exhibition game for Vikings fans to start demanding to see Bridgewater. My thought is that once they hand him the ball, the Vikings will move into the thick of contemporary NFL offenses, and people like Adrian Peterson will be unstoppable. Just a hunch. The easy part, for the Chicago Blackhawks, was returning home to Chicago for a few relaxing days of practice and then the opening two games of the Western Conference final Stanley Cup Playoff series against the Los Angeles Kings. The much more difficult part was for the Minnesota Wild to wake up last Wednesday morning and realize they didn’t have to go practice and prepare to fly to Chicago for Game 7. There would be no Game 7; the Wild season had ended, cruelly, on Patrick Kane’s overtime winner after an absurd bounce off the end boards popped the puck out front. 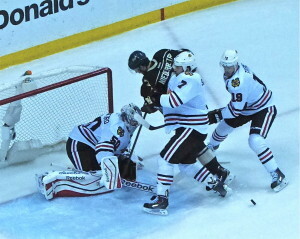 Brent Seabrook and Jonathan Toews couldn’t prevent Wild rookie Nico Niederreiter from getting to goalie Corey Crawford. The goal, and the season-ending result, resonated with the Wild, with their 19,396 fans at Xcel Center, their vast television audience, and with the Chicago Blackhawks — who were outshot 35-27 in the game, and outhit 20-12, but they were not outscored, or outlucked. “We got a very fortunate bounce, and it went to the right player, Patrick Kane,” said Chicago assistant general manager Norm Maciver. “Of course, you’ve got to be good enough to put yourself in position to capitalize on a chance like that, but he’s a special player. Comparing the first two goals of the game was an indication: Less than 2 minutes into the game, Chicago’s Kris Versteeg spun free of Keith Ballard in the right corner and flipped the puck toward the crease. It hit a player, maybe two or three players, and went in. “It took a crazy bounce, I don’t know how it went in,” said Bryzgalov. In the second period, Wild defenseman Clayton Stoner got the puck deep in the Wild zone and flipped it up the boards. Matt Cook, who has absorbed more criticism for his uncompromising forcefulness than praise for his outstanding play, got the puck with his back to the point man, and chipped a perfect backhand pass off the side boards and out across center ice. Erik Haula, at full flight, shifted to a higher gear to get to the puck and get past the defense, and beat Crawford on the breakaway. The team that knows how to win and has won so much found the way to get a “lucky” goal; the team that is just learning to win and has to work hard for its goals, equalized it with a great goal. It stayed 1-1 until overtime, and then the lights went out. Literally. 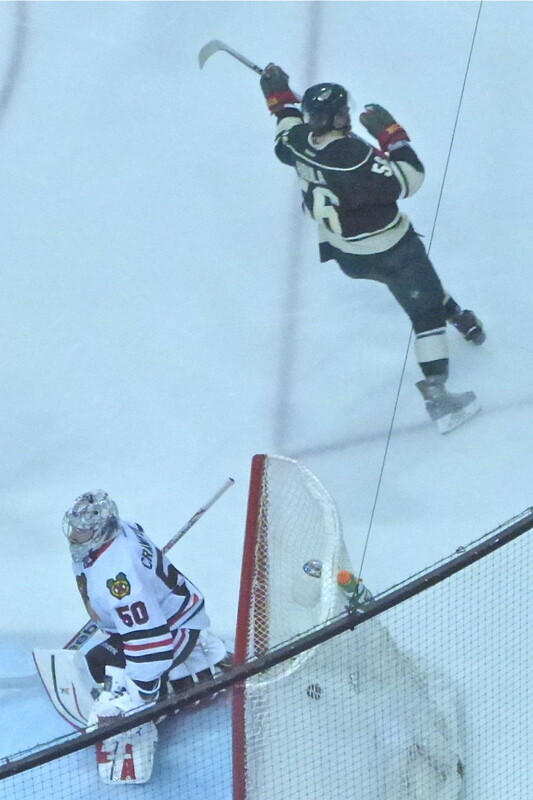 Wild center Erik Haula peeled off after beating Corey Crawford on a breakaway in Game 6. The toughest post-game talk of coach Mike Yeo’s life followed, and he handled it so smoothly you could barely discern the turmoil he was feeling inside in those emotional minutes. Maciver expressed praise for Yeo and his staff. “People like to talk about our great forwards and our scoring,” said Maciver, a former UMD star and Duluth resident. “But the key to our team is how our defensemen get involved in transition play and in the offensive zone. During the season, coaches focus on their own team, how it’s playing and how it’s improving. But in a playoff series, you have enough time to focus on the other team and try to stop them. Mike Yeo and his staff came up with a great game plan, and got their players to buy into it, and they pretty much took our defensemen out of the play. 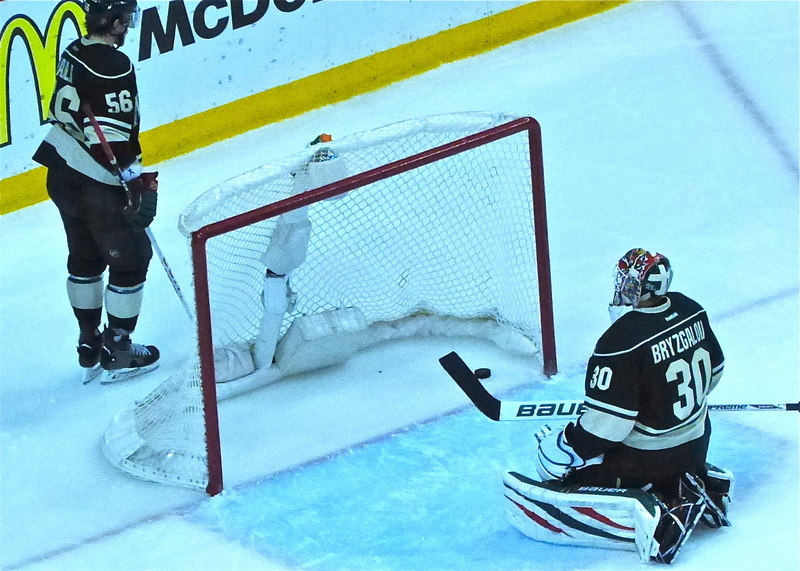 Wild goalie Ilya Bryzgalov could only look back at the puck, still in the goal, after Patrick Kane’s overtime game-winner and season-ender. If the Chicago Blackhawks repeat as Stanley Cup champions this spring, they will look back to the second round and realized they had not faced a more difficult challenge than the Minnesota Wild threw at them through six exhausting games. The Wild outplayed the Blackhawks for great stretches — games even — in their second-round series, and it all came down to the Wild needing to extend their home-ice wizardry in the 2014 playoffs to force a Game 7 back in Chicago. That would duplicate the first round, when the Wild won all three games at Xcel Center against Colorado, and offset losing three games at Denver by winning one critical game — Game 7 — on the road to win the first-round series. A similar scenario was at hand in the second round, when the Wild lost games 1 and 2 in Chicago, won Games 3 and 4 in Saint Paul’s Xcel Center, then lost Game 5 at Chicago. Back at Xcel Center, the Wild seemed to be headed in the right direction throughout Game 6. They outshot the Blackhawks in all three periods, and gained a 1-1 tie on Erik Haula’s breakaway goal early in the second period. Through nine and a half minutes of overtime, the Wild had 19,396 fans on the edges of the X’s seats, by maintaining the edge in play. When Chicago defenseman Brent Seabrook carried the puck out of his zone and across center ice, he was just making a safe play when he hurled the puck up the right boards, intending for it to ring around behind the Wild net, where it might be recovered by a Chicago forward. It appeared there would be no chance of that, because Justin Fontaine, the former UMD star now a rookie on the Wild forward corps, had come back into his own end. “I went to the far boards, so that when the puck came around the boards, I could get it and prevent their point man from getting it,” said Fontaine. From that point on, the entire season will replay itself in a two or three second mental video. As the puck zipped around the base of the boards in the right corner, and Wild players getting in position to gain possession and renew their attack at the other end, the puck suddenly and inexplicable hit a spot where a board-holding strut meets at a seam with the next section. Instead of continuing around the boards, the puck made an abrupt ricochet, straight out from the end boards toward the right faceoff circle. Goaltender Ilya Bryzgalov spotted it, alertly, but instantly realized it was just far enough from him that he dare not venture out after it. He planted himself as Chicago’s Peter Regin came in hard, first to the free puck. As Bryzgalov braced, defenseman Ryan Suter, thoroughly drained as he must have been, raced back and caught up to Regin, tying him up just enough so that both of them overskated the puck. Unfortunately for the Wild, the next man to the puck was Patrick Kane, Chicago’s elusive game-breaker. As the picture shows, there was nothing but dejection in the moment after the realization hit. Bryzgalov, on his knees, turned and realized the puck was still resting there, in the goal, and Haula, the former Gopher whose tying goal made him a candidate for heroism, skated around behind the net. “That was a horrible way to end it,” said Haula. But it was a commendable run by the Wild, one which will bring the team back for training camp all pointed in the same direction. Up. There is nothing subtle about Matt Cooke. He is a block of granite who came back from a questionable 7-game suspension to take the Xcel Center ice for Game 4 in the Wild’s uphill battle against the defending Stanley Cup champion Chicago Blackhawks. It took him a couple shifts to feel in rhythm last Friday night, but then he hustled in to strip the puck from Chicago defenseman Michal Rozsival in the right offensive corner, barged toward the net, and fed the puck out to the right circle. Justin Fontaine wasted no time firing his shot, but by the time he shot, Cooke was at the crease, drawing a couple of escorts as he got to within handshake distance of goaltender Corey Crawford, who had no glimpse of Fontaine’s shot as it hit the net. And his teammates are each several inches taller when Cooke is in the game. Cooke was far from the only star in Game 4, but he was a force, every shift. On one shift, he flung the puck deep into the Chicago zone, just as Blackhawks defenseman Niklas Hjalmarsson took a run at him. The collision was big, but Cooke didn’t flinch and Hjalmarsson wound up sprawled himself. The Blackhawks tied it 1-1 in the last minute of the opening period, when Patrick Sharp raced around Mikko Koivu, who was caught back trying to play defense, and found an opening that didn’t exist against goaltender Ilya Bryzgalov. Undaunted, the Wild regained the lead at 2-1 when Jason Pominville scored early in the second period. Again Chicago tied it, with a deflection goal at 6:28 of the middle period, but Nino Niederreiter broke up the left side and beat Crawford with a great shot to the far edge just 44 seconds later, and the Wild went back on top 3-2, an ample reward for having outshot the Blackhawks 18-9 in the second period. 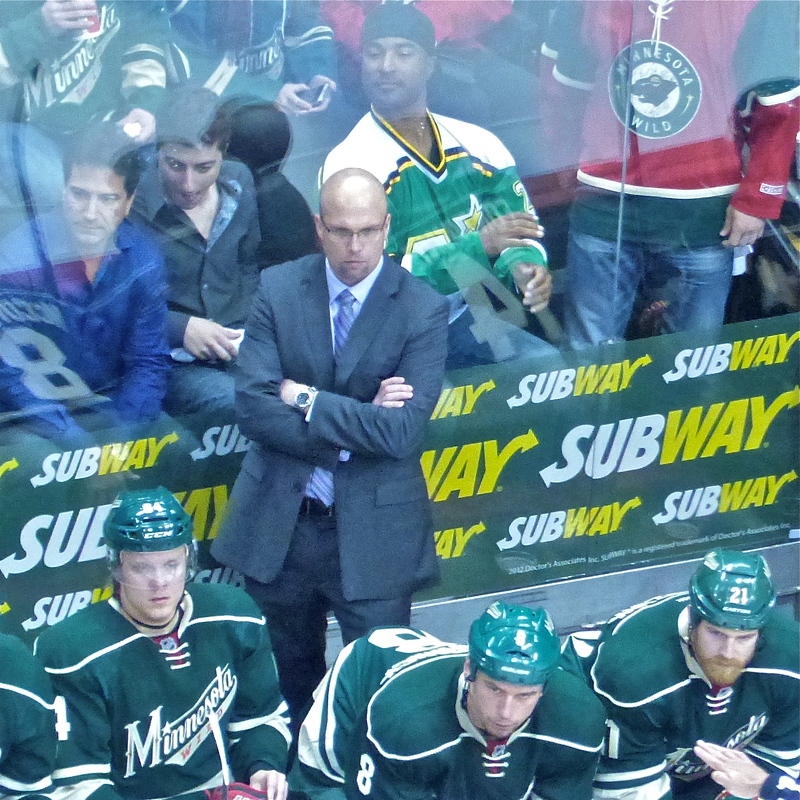 The third period was a montage of great work ethic and coach Mike Yeo’s master line juggling. First, though, there was Bryzgalov, coming up with the right formula to stop Sharp on a clean breakaway, then he stopped Marian Hossa, who swiped the puck from a tiring Ryan Suter and broke free. It was back to tight checking in the third period, but when the Wild got a power play, Suter fed Mikko Koivu, who passed from the left point to Jared Spurgeon in the right circle. Spurgeon loaded up, took a good look, and drilled his third goal past Crawford at 3:47 of the final session for a 4-2 lead. Bryzkalov stopped Jeremy Morin twice on point-blank tries, and Yeo went to work. After establishing Koivu with Charlie Coyle and Niederreiter on one line, Mikael Granlund centering Zach Parise and Pominville on a second, and a dazzling third unit with Erik Haula centering Cooke and Fontaine, the fourth line had Kyle Brodziak with Dany Heatley and Cody McCormick. Shifts were shortened in the closing minutes, and Yeo seemed to be working under some cosmic force as he juggled players. He had Brodziak out there with Parise and Granlund one time, and countless other variations. The constant juggling and the quick, 20-second shifts, kept the Wild fresh even after the exhaustive pace, and kept the Blackhawks off-balance as the Wild tied the series at two games apiece. The first round of playoffs gave Minnesota hockey fans a lot of thrills, as the Wild lost twice at Denver, then beat the Colorado Avalanche in both Games 3 and 4 at Xcel Center. The talented Avalanche won Game 5, but the Wild prevailed in Game 6 at the X, then went to Denver and won Game 7 to complete a thoroughly captivating series. When the Wild lost twice in Chicago to open the second round, Twin Cities columnists kept peppering their readers with the revelation that “The Blackhawks are not the Avs,” implying the Wild had an easy time with the Avalanche, but would have no such gimmes against Chicago. Apparently, they were unaware that Colorado’s inspired 7-1-2 finish allowed them to pass both Chicago and St. Louis to win the Central Division, while the Blues were second, and Chicago was third, six victories and five points behind. “But they’re still the better team,” a columnist told me. True, players like Jonathan Toews, Marian Hossa, Patrick Kane and Patrick Sharp are all high-end players up front for the Blackhawks, but the Wild countered with Parise, Koivu, Pominville, Brodziak, a rejuvenated Heatley, and the prize Kiddie Korps of Granlund, Haula, Fontaine, Niederreiter, Coyle…and, of course, Matt Cooke. It’s been a fabulous run for a challenging young team that seems to have matured and gained new cohesiveness right before our eyes in the playoffs. It’s rare when you can get an NHL assistant general manager to laugh when you’ve told him you hope his team loses Game 6 of a Stanley Cup Playoff series. But I managed. It helps that the assistant GM is Norm Maciver, who has proven to be just as astute in helping put the Chicago Blackhawks together as he was helping the UMD Bulldogs compete at the highest level as a clever and creative puck-moving defenseman. Maciver still lives in Duluth, and he was tormented by not being able to get home very often to see his son Steven play for the Denfeld Hunters. Of course, I immediately realized Maciver couldn’t fully appreciate the other team in that setting, and could only see the Blackhawks perspective professionally. We connected again Tuesday morning by telephone, for my KDAL 610 radio show in Duluth, and he evaluated the series, as both teams prepared for Game 6. “The Wild played exceptionally well in Game 4, and they have all through the series,” said Maciver, whose Blackhawks had ousted Minnesota in a five-game first-round series last year at this time. “If you look at the forwards on both teams, we aren’t quite as deep as we were last year, so our advantage 1-through-12 is not as much as it was. A, the Wild are faster and have more skill, with young guys like Mikael Granlund, Erik Haula and Justin Fontaine. You can also see the improvement in those three young defensemen the Wild have — Jared Spurgeon, Jonas Brodin, and Marco Scandella. In goal, Maciver’s Blackhawks have Corey Crawford, who often is criticized for not being “elite” enough, while the Wild has a musical-chairs rotation that now sees Ilya Bryzgalov in the nets as the No. 4 man on the Wild goalie depth chart. “Last year, Niklas Backstrom got hurt before the first game, and Josh Harding got hurt in about the third game, so the Wild had to go to Darcy Kuemper,” Maciver recalled. “So it seems like more of the same, but you’ve got to give a lot of credit to the Wild coaching staff for the way they’ve got that team playing. We used to get a lot of scoring chances against the Wild, but now we get none; they’ve limited our chances. “Crawford gets a lot of criticism, and a lot of that is because we’ve had a very good offensive team. There are nights we have the puck 70 percent of the time, and when we give up the puck, he might get beat by one. But last year, we won the Cup, and we never would have won it without Corey playing the way he did in Game 6.” Then I asked Maciver, with Game 6 in St. Paul Tuesday night and a potential Game 7 back in Chicago Thursday night, if he wouldn’t really like to see the excitement of a Game 7 back home. “No way,” he said. “We went through such a nerve-wracking Game 7 against Detroit last year, I’d just as soon not go through that again. I’m all for us winning it in Game 6.” We talked for a bit more, then I told Norm I’d be seeing him later Tuesday, at Xcel Center. “And I’ll be pulling for you to get the chance to go back home for Game 7,” I said. That’s when Norm laughed. It’s not often you can get an NHL assistant general manager to get a laugh out of someone suggesting they hope his team loses. Nobody knows, but if the Wild could win Game 6 and take the Blackhawks back for Game 7, Minnesota fans can cheer some more, and if the Blackhawks end the Wild season in Game 6, or 7, at least a few Duluthians will get another chance to see the Stanley Cup, close up. It’s May, but we’re not ready to declare winter over. Not as long as the Minnesota Wild have even the faintest hope of extending their current second-round Stanley Cup Playoff series against the Chicago Blackhawks. And after what we’ve witnessed so far, how much more can we expect? The first-round triumph over Colorado was inspired after two opening losses in Denver, and wound up with victories in Games 6 and 7. Against Chicago, the response from a 2-0 deficit in games was nothing short of thrilling, in a 4-0 victory in Game 3. Well, Game 4 of the series comes next, on Friday May 9, 2014, at Xcel Center in Saint Paul. The Wild players have been resilient enough to survive the loss of their top three goaltenders, with No. 4, Ilya Bryzgalov, silencing his critics with a huge shutout in the 4-0 Game 3. They also had to survive the skill level of the Colorado Avalanche in the opening round, the salvos from the defending Cup champion Blackhawks in the second round, and the often-absurd statements made by some media cynics in Minneapolis who prefer to watch other sports. Coach Mike Yeo excludes all distractions in guiding the Minnesota Wild through playoff pitfalls. Whew! 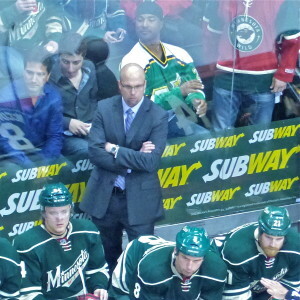 Fortunately, coach Mike Yeo ignores the peripheral stuff and keeps his players similarly focused. When the Wild won Games 3 and 4 against Colorado, then lost Game 5 at Denver before coming back for a colossal Game 6 victory that squared the series at 3 games each, they then captured Game 7 to record the first and only road victory. Chicago, meantime, had beaten an outstanding St. Louis Blues team more promptly, earning a couple days off to await the Wild, who had to fly directly from Denver to Chicago to start the next round. The Wild played a terrific first game, dominating much of the action, but after rallying from a 2-0 deficit for a 2-2 tie, they fell victim to the mercurial Patrick Kane, who fooled everyone in the building with a deft fake back-pass, then sped around to the right of the gathering defense and hoisted an amazing shot up into the roof of the net on the short side, as Bryzgalov dropped, anticipating a more normal shot. Kane scored again on a dazzling pass play, and an empty-net goal made the final a deceptive 5-2. The Blackhawks broke open a 2-1 second game to win 4-1, prompting critics to write that the Blackhawks had breezed to two easy victories over the Wild. That’s also when complaints arose that Parise, Pominville and Koivu weren’t scoring. What baseball writers don’t understand is that in hockey, you don’t get to step into the batter’s box unmolested three or four times a game and get repeated chances to connect; in hockey, you have to fight through guys trying to knock you down, break you up, and prevent you from ever getting a chance, and then you’ve got to beat a standout goaltender. Besides, the best measure of how good the Wild have become is that the likes of Mikael Granlund, Nico Niederreiter, Erik Haula, and the rejuvenated Dany Heatley could rise up and be the heroes. Good hockey fans don’t care who scores as long as somebody scores to give the team a chance to win. But there is more to the criticism. First of all, through Game 2 of the Chicago series, Parise was 3-8–11 in nine games, which put him among the playoff scoring leaders, and, last I checked, an assist means somebody on the team scored a goal. Koivu and Pominville were both 1-5–6. Looking over Pittsburgh’s statistics, Sidney Crosby, possible league MVP and certain NHL scoring champion, went through the first nine Penguins playoff games without scoring a goal. He was 0-6–6 and a minus-5, but do we think the media in Pittsburgh was clamoring to bench or demote Crosby? . On Monday night, Crosby got loose to score his first goal on a breakaway in Pittsburgh’s 10th game. Also, Chicago is an outstanding team, maybe an awesome team, and maybe just as good as the Blackhawks team that eliminated the Wild in five games and won the Stanley Cup last spring. And yes, they are not the Colorado Avalanche. We know they’re not, because the Blackhawks finished third in the NHL’s Central Division, one spot ahead of the Wild, and one spot behind the St. Louis Blues, who were second. The Avalanche? Oh yeah, they won the division. So we know the Blackhawks aren’t the Avalanche, because the Avalanche won the division and Chicago was third. Coming home trailing the now-healthy Blackhawks two games to none was not a pleasant task, but also not an impossible one. It was a scoreless duel for two periods, both teams straining for a scoring chance, and not unlike two baseball teams engaged in a double-no-hitter for six innings. Then, once again, Haula and Granlund proved that the Wild scoring depth can sting. Haula, the former University of Minnesota center from Finland, fed Justin Fontaine ahead on the right side, and broke hard toward the net. Former Minnesota-Duluth standout Fontaine sped up the right boards and saw two or three defenders between him and the net, but he also sensed Haula breaking. So he lofted a perfect saucer pass, right-to-left across the slot and through the defenders. The puck landed in perfect position for Haula, who arrived at the right edge to score a one-time deflection goal. Not bad for the checking line: a Bulldog and a Gopher, fierce rivals a couple years ago, collaborating on a goal that electrified the big crowd. An even more spectacular play, which could have had four assists, followed quickly, winding up with Pominville getting the puck on the right, from Parise, and relaying it across the slot to Granlund, who cut through the vaunted Chicago defense, shifted from forehand to backhand, and ruined Corey Crawford’s night with a backhanded flip into the right edge for a 2-0 lead. 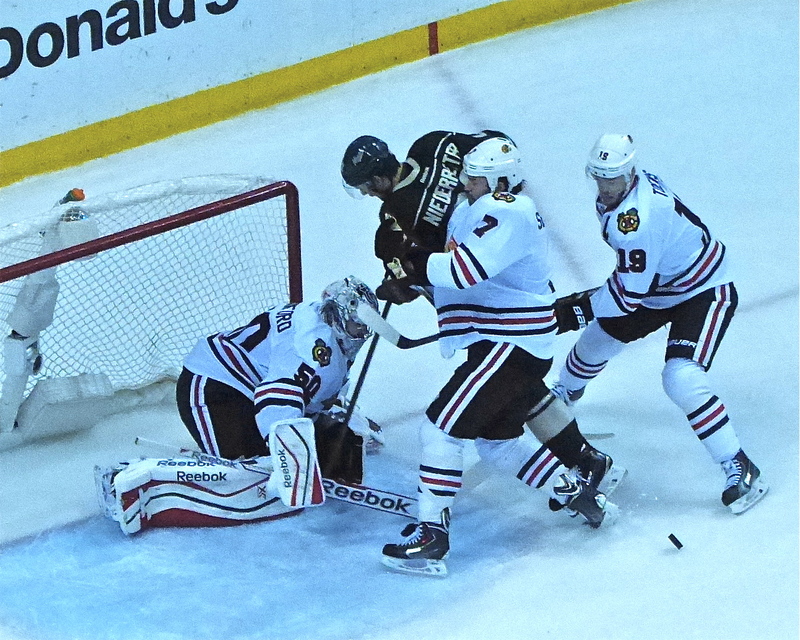 Then it was Parise’s turn, artfully deflecting Suter’s point shot past Crawford, but squarely off the left pipe. Cat-quick, Parise whacked the rebounding puck in for a power-play goal — his fourth of this playoff season but first in the series — and it gave the Wild a 3-0 lead. With time running thin, Chicago coach Joel Quenneville pulled Crawford for an extra skater. This time, Neiderreiter, the pride of Switerland, made another highlight-video rush, end-to-end. He got free along the boards to shoot for the open net himself, but he instead set up Granlund for the empty-net goal and a 4-0 victory. Bryzgalov was superb in goal for the shutout, and a rush of hope engulfed Minnesotans everywhere. By the way, the oft-repeated slam non-hockey media types throw against hockey, that the Wild can never hope to match the fan support of the Twins, Vikings or Timberwolves, brought the television ratings into focus. Going into this year’s NHL playoffs, Fox Sports North had recorded the Twins pennant-deciding victory over the White Sox in 2010 as its all-time ratings leader, with a 15.3 household rating among Twin Cities market television sets. Each rating point accounts for 17,280 tuned-in households. In this year’s Wild playoff, Game 1 against Colorado had an 8.1 rating, Game 2 a 7.7, Game 3 a 9.6, and Game 4 was a Wild record on Fox at 12.7. Game 5 had an 11.2 household rating, breaking the Wild record just set, and Game 6, at Xcel, had a 13.9 — rebreaking the record for any Wild telecast ever. Game 7, in Denver, set a new standard with a 16.4 household rating, for the highest rating of any event ever broadcast by Fox Sports North. The game also was worth a 32 share, which means 32 percent of all the Twin Cities TV sets that were turned on were tuned in to the Wild game. Even better, when word spread about Game 7 going into overtime, the statistics jumped to an 18.3 rating and a 49 share, well beyond the all-time record that broadcast was setting. We can only speculate on what the ratings will be like Friday night for Game 4 of the Wild-Blackhawks series. The surprising number of non-hockey fans in the Twin Cities media will remain unconvinced, but the general public in the “State of Hockey” knows better.